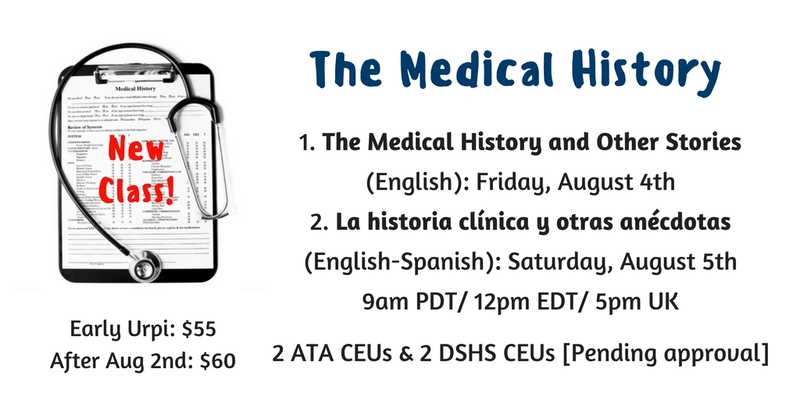 During this 2 hour *live webinar* participants will learn about the basic concepts and terminology about the general Medical History and all that paperwork! We will talk about key medical terms, signs and symptoms, why all those weird questions, and what to do in difficult circumstances when they arise. This webinar will provide 2 ATA CEUs, and 2 DSHS CEUs (pending approval). If you are an interpreter of a language other than Spanish. You can't make it to the live webinar? Don't worry. We always record our webinars. So if you enroll in the class you will have access to the recording for one week and you will receive all the material we used in class.